just stumbled upon it on Kijiji..
Elaine you should buy it!! 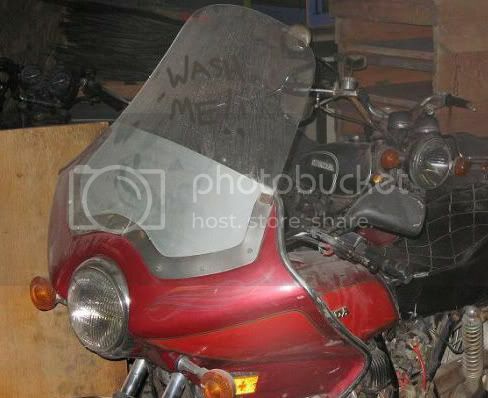 hmm you think they could've cleaned it up before posting a for sale ad? I agree with Heidi! !...get rid of the farring, put a cafe racer seat on it, & change the bars and voila!!.. Id also remove the chain guard. WHAM.. instant cafe racer and super cheap.. If you change your mind, you can flip it for $1000. Its a super good deal.. I bought my 69 cb450 in practically the same shape for $375 including delivery. It didnt even run. I sold it for $800 6 months later in the same shape. I just pulled off the farring. Why all the good ones in the GTA haha? well..technically this isn't gta...it's out around london, but i suppose it depends where YOU are, cosmo!! Regina SK / Calgary AB, long ways to drive.